On what was probably the only day I hadn’t washed my hair in the entire year of 2010, my mum came into my bedroom to inform me that my bedside lamp was not quite up to house standards, and that I should invest in a new one. Unbeknown to her I’d been in the middle of filming what was (from what I remember) a really exciting video blog for my second year film at Edinburgh College of Art, Pooling Together. The response from festivals was great although due to financial reasons and a part time-job in Boots the chemist, I didn’t manage to attend many of the screenings. Retrospectively, I would ditch the meal deals for being there in person more often when my film played. I think it makes a massive difference to both audience engagement and being remembered when you are in attendance. Still, someone had to take care of the Boots Advantage Card holders, and that person was me. Once the film had finished its festival circuit I was looking for a special event or day to launch online. Mother’s Day had always been in the back of my mind as a good launch day, however it wasn’t really convenient timing. The last couple of festivals had been in May and June, and my birthday was in July, so I thought, why not launch it on my birthday? That way, people who want to wish me a happy birthday on Facebook can do so by sharing my film. 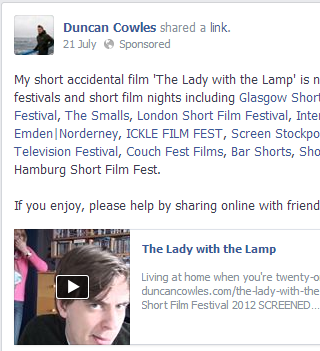 So on the Sunday the 21st of July I shared the film on Facebook & paid £5 to make it a ‘sponsored’ post. A sponsored post gets seen by more people in their news feeds, apparently. Hard to tell how much of a difference it really makes – but £5 isn’t too much money for a couple more views. The idea worked OK and I received around 500 views on the first day, albeit with multiple grumbles from some friends that my face wouldn’t leave their news feed. I would note that normally Sundays aren’t the best day for an online release. Internet sources differ on which day maximizes your likelihood of views, but one thing they all agree on is that Sundays aren’t great. I took a chance on my birthday technique; it’s impossible to know whether or not it would’ve been significantly more effective on a different day of the week. Normally though, I’d avoid Sundays. On top of the Facebook strategy, I also took the time to email anyone who’d expressed an interest in seeing the film, and every film festival that had shown it to alert them to the film’s online release. Almost all the festivals helped by sharing a link on their Twitter, Facebook pages or in a couple of cases on their websites, which definitely boosted the views on the Monday. A few people recommended that YouTube was the next step. With Vimeo broadcasting to communities with an interest in film or design, YouTube broadcasts to ‘the world’. Slightly concerned about what ‘the world’ might think, I loaded my mum up onto YouTube and let her sit there. I didn’t want to promote the film much more as I was aware that I was probably on the verge of losing some friends if I posted anything to do with The Lady with the Lamp to my Facebook one more time. A couple of weeks passed, I went for a one-night holiday in Fort William, took a weekend trip to Latvia, saw a few Edinburgh Fringe shows, and the film received just one comment and 87 views. When I got home I sat and watched in amazement whilst Mum came in and out of my room talking about her new block of tap dancing lessons that she’d started that day. It was quite exciting (the views coming in, not the chat about tap dancing) but made me feel slightly queasy for a while, which wasn’t ideal as I was going out for a meal with a friend. Anyway, I overcame the weird feeling of having a whole bunch of people you don’t know talking about your mum, and went out to enjoy dinner. I had spring rolls to start and then a burger for main. Pretty tasty on the whole. At first I found it a bit shocking but then, after thinking it through and speaking to my mate on the phone, I became less concerned. After all, I do speak to Mum. I go for coffee most weeks with her in Café Nero. It even explains in the info box below the video that I love my mum, she likes the film and is happy for others to enjoy. Most people won’t read the info box though, that’s another thing I learnt. She’s adorable, and she loves you. Is she single? He can’t be 21, he looks like he’s around 36. Nah, don’t buy it… He’s living at home at 36. So, advice to anyone putting anything on YouTube would be: brace yourself for harsher criticism than you’re used to, especially if you appear in the clip yourself and forgot to wash your hair that particular day. To those who ask me, in reference to the video going viral overnight, “how did you do it?” I have no real answer for. I didn’t do anything to encourage the views on YouTube. On Vimeo I campaigned all week for the views, re-tweeting, emailing, posting etc. but on YouTube, I just let it sit there until somebody picked up on it and shared it. It could’ve sat there for years before that happened. There’s no real way to predict it. According to statistics from YouTube, 80% of the views were from males and 80% of the views came from the USA. I’m not sure what that says or means but I felt it was interesting enough to mention. 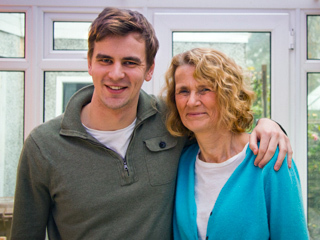 People ask me a lot: “What does your mum think of being all over the internet and talked about by complete strangers?” I told her about the whole thing, negative comments, front page, MSN.com etc. and she replied: “Oh that’s great! If I Google search it will it come up? I’ll need to send it to Kathleen” (her mate across the road). So I’m pretty sure she’s cool with it. 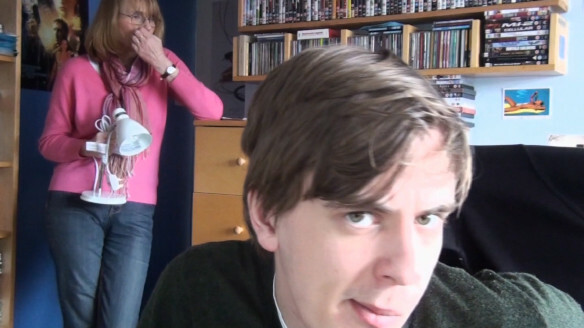 With so many of the YouTube comments complaining about me not speaking to Mum in The Lady with the Lamp, it did make me slightly concerned about what people might think about my twenty-one minute graduate film Radio Silence, in which I investigate the reasons why I find it difficult to speak to my father. I’ll maybe just stick to festivals and Vimeo for this one. *** UPDATE *** (11/02/15) – You can now watch Radio Silence in full online here.